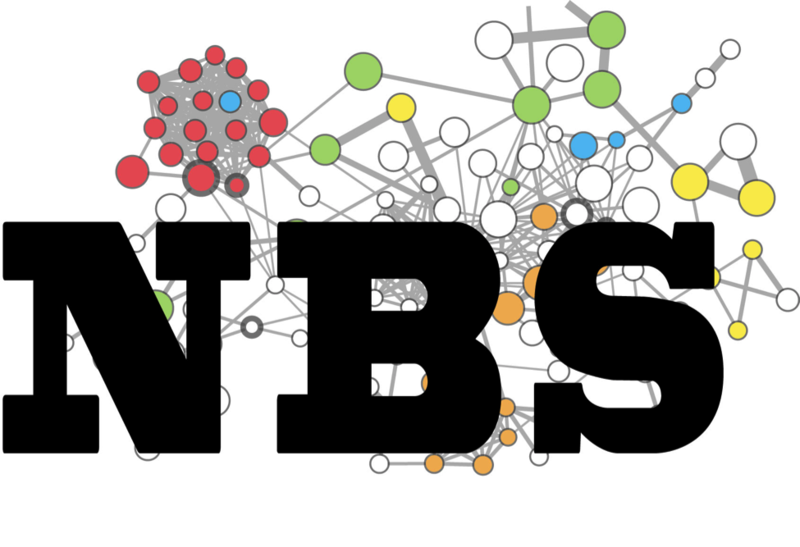 The aim of the National Resource for Network Biology (NRNB) is to advance the new science of Biological Networks through analytic tools, visualizations, databases and computing resources. Biomedical research is increasingly dependent on knowledge of biological networks of multiple types and scales, including gene, protein and drug interactions, cell-cell and cell-host communication, and vast social networks. Our technologies enable researchers to assemble and analyze these networks and to use them to better understand biological systems and, in particular, how they fail in disease. NRNB leverages the Cytoscape Cyberinfrastructure, a widely-used network analysis platform which we further support through a rich set of tutorials, workshops, 24/7 help desk assistance, and over 100 collaboration and service projects. We are developing freely available, open source software technologies to enable network-based visualization, analysis, and biomedical discovery. We are driving research and development projects, coordinating training opportunities, and actively seeking new collaborations to develop NRNB tools and apply them to biomedical research. We have been awarded another five years of funding by NIGMS for the National Reseource of Network Biology. This was our first round of competitve renewal as a resource center and thus a major test of both our track record and our vision. We have identified three major themes in Network Biology that will define our technology research and development projects. With this renewed investment, we will also continue to pursue a broad range of collaboration and training opportunities. NeXO (The Network Extracted Ontology) uses a principled computational approach which integrates evidence from hundreds of thousands of individual gene and protein interactions to construct a complete hierarchy of cellular components and processes. 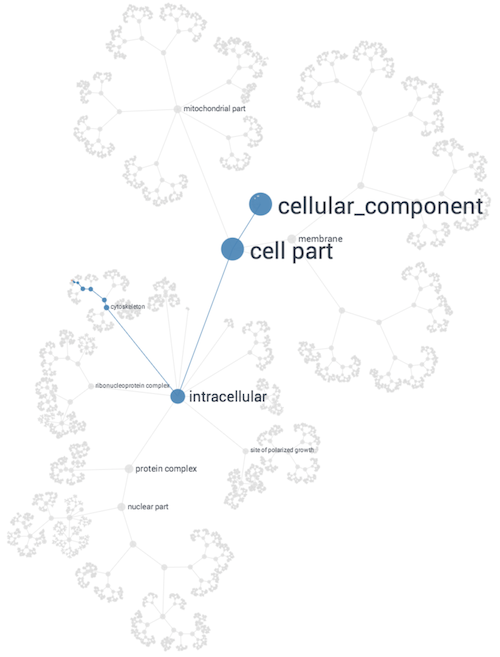 This data-derived ontology aligns with known biological machinery in the GO Database and also uncovers many new structures. NBS is a method for stratification (clustering) of patients in a cancer cohort based on somatic mutations and a gene interaction network. The method uses network propagation to integrate genome wide somatic mutation profiles for each patient over a gene interaction network, and a non-negative matrix factorization based clustering approach in order to derive biologically meaningful stratification of a patient cohort. The overarching goals of the Cytoscape App Store are to highlight the important features apps add to Cytoscape, to enable researchers to find apps they need, and for developers to promote their apps. 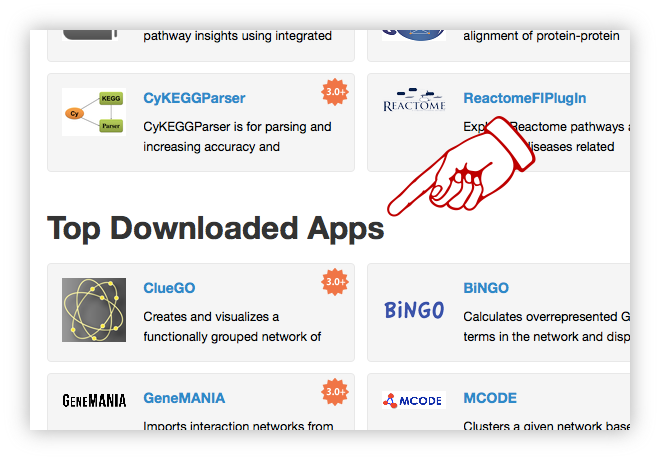 The Cytoscape App Store highlights the important features that apps add to Cytoscape, enable researchers to find and install apps they need, and help developers promote their apps. 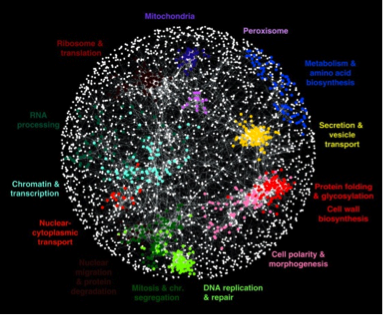 Our research programs are exploring an array of new approaches to network analysis, such as how to use molecular networks to stratify cancer patient genomes (Network-Based Stratification) or how to assemble a gene ontology of the cell directly from molecular network data (nexontology.org). 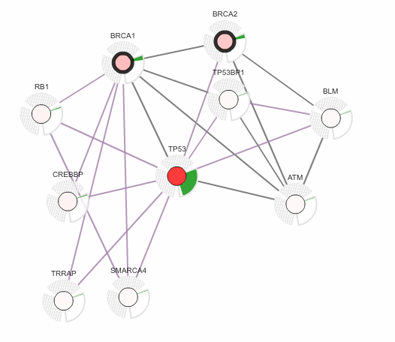 In recent years we have released a number of widely-used network analysis resources, including the Cancer Biology Portal (cBioPortal.org), the GeneMANIA network database (genemania.org), and the Cytoscape Appstore (apps.cytoscape.org). In his book CONNECTED, NRNB investigator James Fowler argued that "social networks are in our nature." 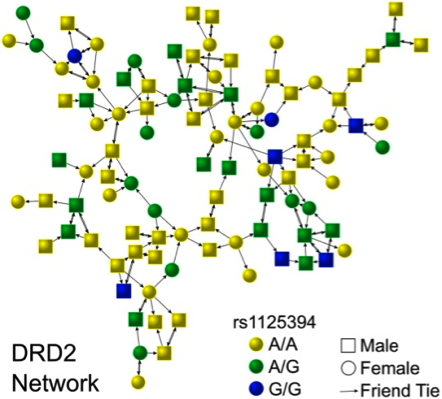 Then last year he published a paper showing that genes influence our social network position -- how central we are, and how likely it is that our friends know one another. In a related NRNB study published in PNAS this year, Fowler examined another important social network process called "homophily" -- it's a word that literally means "love of like" and it refers to the idea that we tend to make friends with people who resemble us -- "birds of a feather flock together." NRNB investigator Gary Bader has been collaborating with scientists at the University of Toronto (Charles Boone, Brenda Andrews) to complete the first complete genetic interaction network for a cell and to decipher the general principles that govern this network. 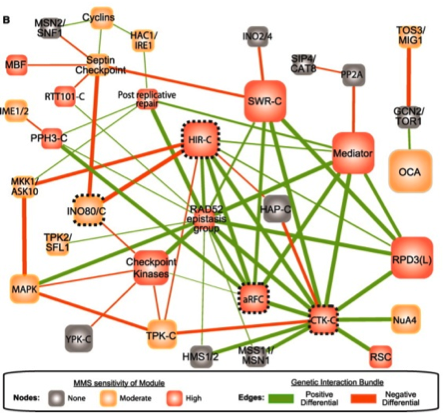 This reference map provides a model for expanding genetic network analysis to higher organisms, and it will stimulate valuable insights into gene function, drug target and mode-of-action analysis. The resulting complete map of genetic interactions for budding yeast, with ~6000 genes, will contain 36 million quantitative interaction pairs (18 million unique pairs). The most recent publication of roughly 20% of the complete map was in the top 30 most cited papers of 2.2 million in 2010. The map currently is 75% complete and continues to be analyzed. Although cellular behaviors are dynamic, the networks that govern these behaviors have been mapped primarily as static snapshots. To explore network dynamics, the Ideker laboratory has been collaborating with the laboratory of Nevan Krogan at UCSF to analyze interaction networks as they are remodeled by different cellular stresses and stimuli. This past year, they developed a new approach called differential epistasis mapping (dE-MAP) which creates a genetic network based on the changes in interaction strength observed between two static conditions. Using this approach, they have mapped widespread changes in genetic interaction among yeast kinases, phosphatases, and transcription factors as the cell responds to DNA damage. This proof-of-principle work suggests that differential networks chart a new type of genetic landscape that will be invaluable for mapping many different cellular responses to stimuli.